One of the most important tools you can have for a long back-country hike or camping trip is your pocket knife. My personal favorite is my Leatherman Skeletool . I’ve had it for years now and use it constantly. If we’re not taking the Jeep out to the back-country, hiking or camping somewhere, it pretty much never leaves the console in my truck. Multitools are handy, but some of them have a tendency to be too heavy, with too many accessories that you’ll never use. They also have a tendency to be bulky and uncomfortable in your hand. 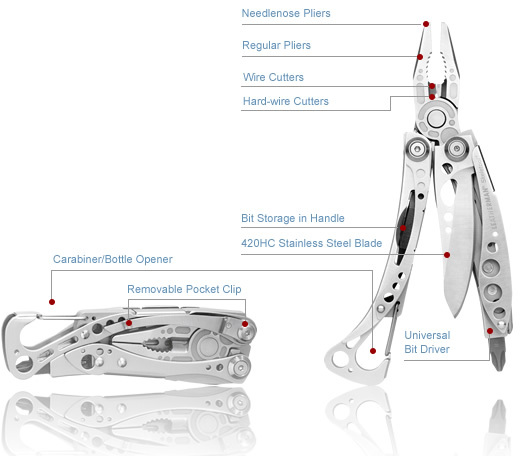 The Leatherman Skeletool solves this problem by getting rid of the excess stuff that you won’t have any use for anyway. I really don’t need a fingernail file, spoon or saw on my multitool. What I do need is for it to be light, and this is one of the best ones at only five ounces. A good blade, with a portion of it serrated, and a pair of pliers is really all I need. This one does have a handy bottle opener, which I use quite often. I could do without the screwdriver though, but it doesn’t add much weight anyway. When you’re hiking in the desert a good multitool is a must have. If you brush up against or step on a cactus, you’ll be happy to have the pliers along to pull out the thorns (everything out here seems to either have thorns or a stinger). I would recommend throwing a small pair of tweezers in your pack in case you need to pull out glochids (those little hair-like cactus thorns that you almost can’t see), the pliers wont be much use for that. Now, I wouldn’t recommend the blade for heavy work. You’ll need a good, full-tang, fixed blade knife for that. The blade in the Leatherman Skeletool will hold a good edge, and is good for fine work like cutting cordage and similar tasks, but don’t go hacking at tree branches or try to pry something open with it. You’ll need a new one pretty fast if you treat it like that.